The good: Green Tea is efficient in boosting the metabolism. The bad: It does not contain enough Glucomannan. The bottom line: SomnaSlim is not one of our favorite weight loss pills as it has inadequate quantities of Glucomannan, Chitosan, and Gymnema Sylvestre. 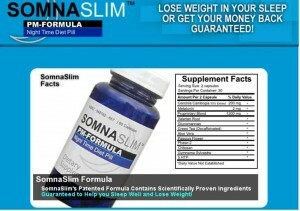 SomnaSlim is a diet pill that is intended for persons who would like to “lose weight in your sleep” You need to specifically study the composition and ingredients of SomnaSlim to understand if it can match its statements. The SomnaSlim has done a remarkable task of outlining the components used in its preparation along with the study to prove it. But, before you can be thrilled at such an attractive prospect, you need to clearly understand its ingredients to find out if it is effective or just a marketing gimmick. Garcinia Cambogia’s active ingredient is HCA. Research has proven that it is a helpful stimulant which does not cause jitters. As it is a non-jitters stimulant, it is the primary reason that it is used in SomnaSlim. According to a study conducted over weight weeks, consuming 2-4 grams of Glucomannan a day results in an average weight loss of 5.5 lb. However, the dosage in SomnaSlim’s proprietary blend which contains Glucomannan is a mere 1.2g. This may seem big for a proprietary blend but to be effective as per studies, it does not contain enough Glucomannan. This means that it will definitely yield weight loss but will not be very effective. Years of study has proven that Green Tea is efficient in boosting the metabolism of the body. It can be mentioned that the green tea used in SomnaSlim is decaffeinated as this diet pill is meant to be consumed in the night. The health benefits of Aloe Vera are undisputed and it is used as a gentle laxative with reasonable success. The application of Aloe Vera for losing weight is largely for colon cleansing. However, the wanted results may not be achieved with SomnaSlim as the dosage of Aloe Vera present in the preparation is inadequate. Chitosan when consumed in high doses results in a little weight loss. But the quantity present in SomnaSlim is not sufficient enough to result in sufficient weight loss. Gymnema Sylvestre when used with a blend of Yerba Mate and Chromium results in immense weight loss. However, SomnaSlim does not use YerbaMate or Damiana in its preparation. 5 HTP is an effective mood enhancer and a forerunner to Serotonin. Valerian Root, Passion Flower, and Melatonin all help to achieve peaceful sleep whose advantages are more than just weight loss. 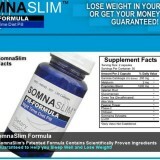 The pricing of SomnaSlim is $14.95. This may seem as a good deal but one has to be cautious of products priced below the norm. However, paying $14.95 to try out a weight loss product which may yield results is not a bad deal. SomnaSlim is surely not one of the favorite weight loss pills as it has inadequate quantities of Glucomannan, Chitosan, and Gymnema Sylvestre. However, there could be some advantages from using a diet pill meant for night use. It may not be the best but there are not much negative aspects to mention. I have taken Somnaslim for a month and it certainly helps me sleep, but I have lost no weight, even though I have been watching calories, intake of fats, etc., and have walked and worked out daily. In fact, I had only lost 3 pounds without it, and nothing with taking it for a month. Suggestions?